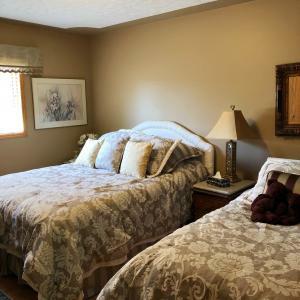 McDougall Lane Bed & Breakfast offers five guest rooms including shared bath and private bath suites. All of our rooms are air conditioned and have television and mini-fridges for your convenience. A full breakfast is served in the morning for all guests and is included at no extra charge. 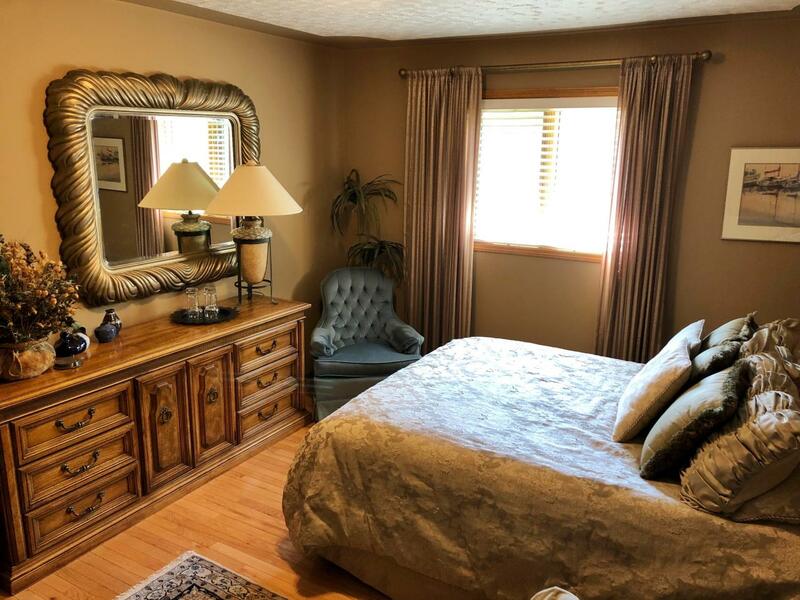 furniture and boasts ample room with a queen sized bed, mini fridge and tv. are part of McDougall Lane Bed and Breakfast. Rates: $134.95 Canadian per night for double occupancy. 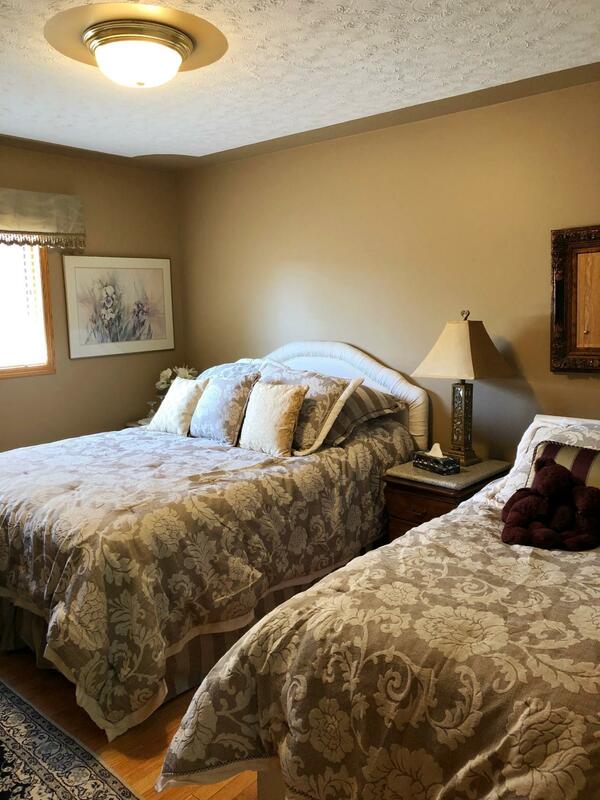 $20.00 for every additional adult per night. $10.00-15.00 for every additional child (up to 18 y/o) per night. Rate includes full breakfast for each guest. The Floral Room is another of our shared bath rooms. The floral room has a queen sized bed as well as a single. It is a large room with a wonderful view of the ponds and fountains. Not only are flowers abundant in this room, but from the window our fabulous flower gardens can be seen. This room is air conditioned, and has ample closet space for baggage and clothing. The Floral Room is very well suited for a group of three. This room is decorated in French Provincial. 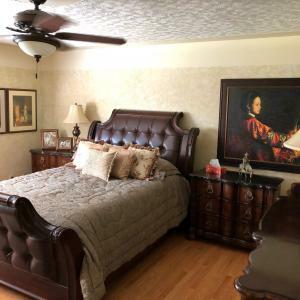 Fine hardwood furniture complete with queen sized feather bed, this room is a favorite to many. The Mallard Room is perfect for a travelling couple or a young family of four. An extra bed can be brought in easily with room left over to accommodate more people. 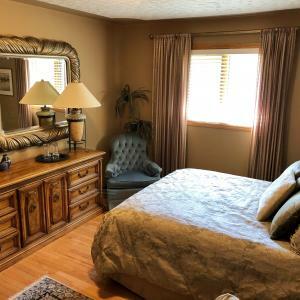 This suite is the largest of our shared bath rooms, and from the window you overlook the front flower gardens and ponds with a backdrop of the dynamic badlands landscape of the Drumheller Valley. Rate: $134.95 Canadian for double occupancy per night. The Master Ensuite is our beautifully decorated private bath ensuite done in Mediterranean furniture. The Master Ensuite is made up of a large bedroom area with steps down into the loft area which over looks the elegant formal living room. 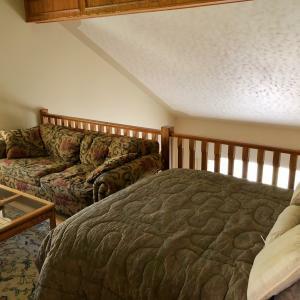 The loft area has in it a double bed and a chesterfield with television and sitting area. The main bedroom has a queen sized bed and right off it is the mirrored dressing area, and the bathroom which has a modern walk-in shower. The Master Ensuite can very comfortably accommodate a family of four, but an extra bed can always be brought in to accommodate more people. 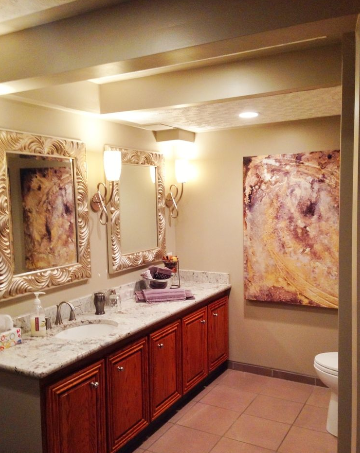 This room is a favorite for families and couples who wish for a private bath. Rate: $179.95 Canadian per night for a double occupancy. The Garden Suite is a luxurious seven-hundred square foot suite with its own private sitting area, separate garden doors leading you outside into our overflowing flower gardens and water gardens with ponds and fountains. 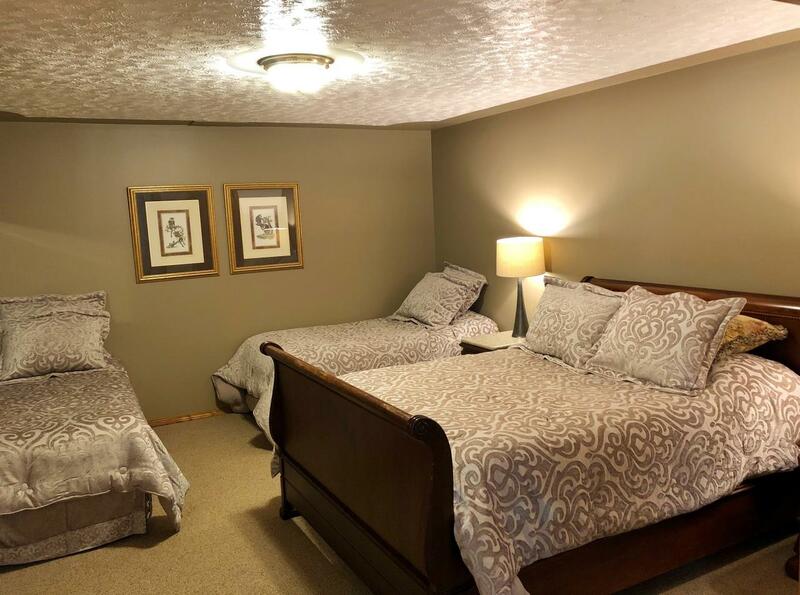 The Garden Suite is comfortable for families, or long stay guests. It comes complete with a 36'' television and V.C.R/DVD, private bathroom, and separate sleeping quarters. 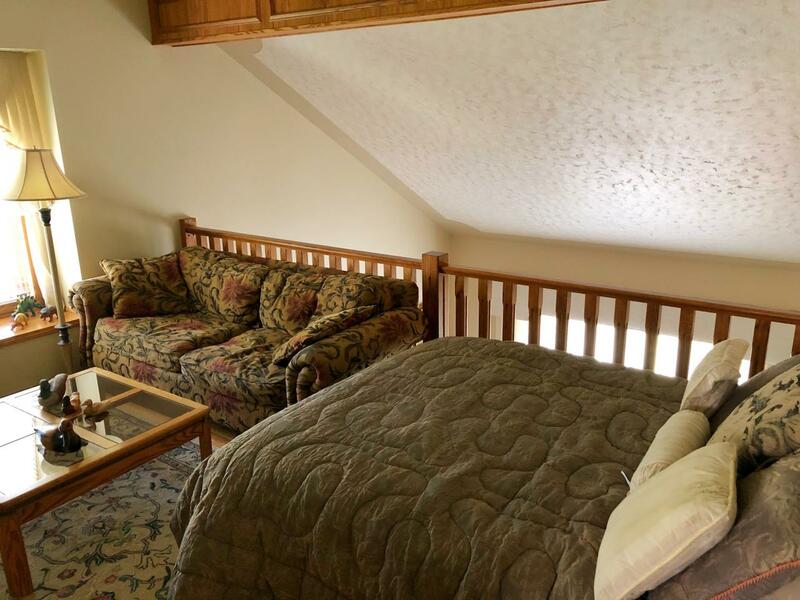 The Garden Suite also has a pool tablewith rumpus area, making it ideal for relaxation and winding down after hiking, or dinosaur excavating in the badlands. 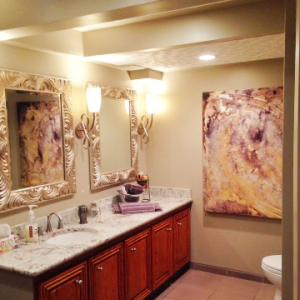 The whole area is finished in ceramic tile, and berber. French doors open to reveal the private bedroom finished in clear pine. 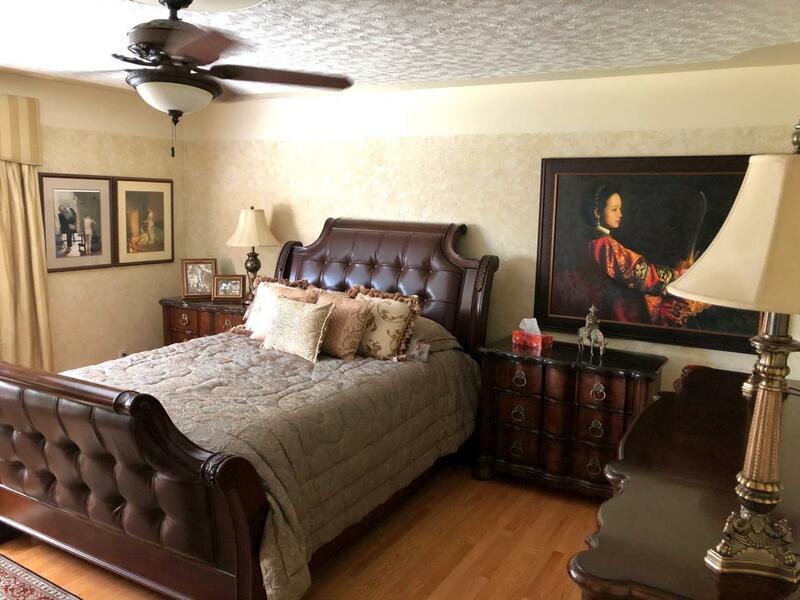 This bedroom has a queen sized bed and two single beds, also this suite has a hide-a-way bed to accommodate even more people.